Relief Sales are a unique way to raise funds for aiding needy people around the world. These sales, which numbered over 40 in 1998 in the United States and Canada, raised over $4 million to support the programs of Mennonite Central Committee in more than 50 countries. From the first publicized relief sale held in a barnyard near Morgantown, Pa., in 1957, this people's movement has grown to an annual festival in each region and province of the Mennonite constituency. New Hamburg, Ont., was the site, in 1967, of the first relief sale in Canada. Relief sales are popular because people can serve in a worldwide ministry at home in a way reminiscent of earlier community efforts such as barn raisings, butcherings, and threshings. Relief sales occur wherever North American Mennonite communities are clustered, whether rural or urban. Words such as "fund raising, fellowship, fixin's, festivity far-reaching, fun, faithfulness, and food" were used in a 1978 folder to describe a relief sale. Although the idea of relief sales did not originate with MCC, its material aid director, John Hostetler, for many years was the liaison with the sale committees for information and advice. He also assisted such cooperative ventures as the meeting of relief sale organizers held annually at one of the relief sale sites. 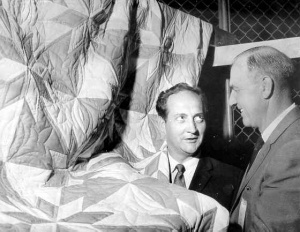 William Steckle (left) paid a record $350 for this quilt at 1967 Relief Sale in New Hamburg, Ont. Ward Shantz, sale manager at right. Local committees and autonomous organizations have bonded people in a grassroots movement inspired with a desire to help others. Preparations and committee meetings are generally a year-round operation. Items are sold at auction or offered at a set price. There are always food specialties: dried fruit and New Year's cookies, borscht and zwiebach, shoofly and strawberry pies, funnel cakes and Russian pancakes, apple butter and peanuts, sausage and cheese. Setting the date for a relief sale is usually determined by agricultural seasons, providing a time when it is most convenient for rural dwellers to participate. In urban areas, the school and church calendar determine whether to hold the sale in spring, summer, or fall. The seed idea of a relief sale may have been planted in Lancaster County, Pa., in 1948, when a group of Mennonite farmers gathered harvest produce, quilts, and farm items for auction at a sale in the town of Gap and gave the income to MCC. 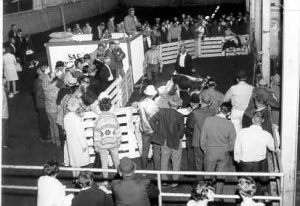 Following the 1957 Morgantown sale on the Ralph Hertzler farm, also promoted by Ford Berg and Milford Hertzler, the idea of relief sales spread rapidly. Giving to MCC rose as relief sales spread across the continent. During the 1970s, relief sales contributed about one-fourth of MCC's total income from its constituency. Through 1987, 435 relief sale events in the United States and Canada netted $32 million for the relief, service, and development work of MCC. Lively participation of men, women, young people, and children has created networks and friendships across Mennonite, Amish, and Brethren in Christ denominational lines. Special talents and interests are nurtured as people serve on planning committees and contribute their skills in quilting, hog butchering, public relations, food service, arts and crafts, gardening, woodcraft, and home baking. Sale promoters have sought to cover all costs in advance so that on sale day they can say, "Each dollar raised goes directly to MCC for helping needy people." Kickoff dinners or banquets are held prior to the sale in some areas to promote the sale and raise funds for sale expenses. In Kansas fellowship dinners have become popular since the first event in 1981. Families volunteer to be guests or hosts. On a designated Sunday, host families serve a meal to guests from other congregations assigned to them by a sale committee. In return for the dinner, the guests make a contribution to the relief sale budget. In 1988, 832 people went as guests to 160 host homes in 54 churches raising more than $12,000 for the Mid-Kansas MCC Relief Sale. Additional money was raised through pledges from churches and Sunday school classes. In Manitoba, one person has raised substantial funds for sale expenses by taking pledges for his marathon run. Promoters interested in encouraging the wider public to attend the sales have turned to media coverage, including television public service announcements and radio talk shows. At some sales buses bring people from long distances for the event. Products advertising the sale come in the form of custom-designed belt buckles, yardsticks, T-shirts, caps, and mugs. Efforts have been made at some relief sales to interpret to visitors what their contributed dollars will do. Special projects are promoted which not only raise money but also educate about the way aid is given as through the demonstration of appropriate technology like the Bangladesh rower pump used for irrigation. Needs of a distressed country are emphasized and contributions received to aid that country. Since the beginning of the Nebraska relief sale in 1980, a peace booth has sought to connect the militarism of rich nations with the injustices and poverty experienced by poorer nations. During the late 1960s, when relief sales were spreading rapidly to new states and provinces, questions were raised about the validity of sales as fund raisers. Some felt that the church was tending toward commercialism and undercutting voluntary giving. However, others felt that relief sales were a creative way to allow people to give of themselves, to raise money that would not be given in traditional ways, to foster cooperation between denominations, and to be a positive witness in the community. Controversy over the philosophy of stewardship has not hindered the interest in and the growth of relief sales. When patterns of North American consumption came under scrutiny in the 1970s, some argued that relief sales did little to promote a responsible Christian life-style. After publication of the More-with-less cookbook and Living more with less, by Doris Janzen Longacre, a number of sales featured ways that North Americans might limit consumption and develop new eating patterns. In 1977, at the Kansas relief sale, a More-with-Less kitchen featured sample foods and sold cookbooks autographed by the author. Some relief sales have booths promoting natural foods and offer fresh fruits, juices, nuts, and dried fruit as in alternative to less nutritious foods. Overseas crafts (SELFHELP; later Ten Thousand Villages) in the decade of the 1970s began to appear at relief sales. The wide range of useful and decorative items coming from skilled artisans in many developing countries found a new marketing outlet. Foreign crafts add an international flavor to an otherwise local event. Often volunteers from Ten Thousand Villages/thrift shops in the area handle the sale of these crafts at a relief sale. Nearly all Mennonite congregations in the area of an MCC relief sale find some way to take part in this festival and benefit auction event. A relief sale is people sharing their skills and gifts to help the hungry at home and abroad. Goossen, Rachel Waltner and Robert S. Kreider. "Organizing Festivals for MCC: Relief Sales," in The Mennonite Central Committee story, vol. 5: Hungry, Thirsty, a Stranger. Scottdale, PA, Herald Press, 1988. Listings of relief sales were found in the Mennonite Church Yearbook through 1997, in the Mennonite Directory, 1998-2000. Shelly, Griselda. "Relief Sales." Global Anabaptist Mennonite Encyclopedia Online. 1989. Web. 23 Apr 2019. http://gameo.org/index.php?title=Relief_Sales&oldid=93366. Shelly, Griselda. (1989). Relief Sales. Global Anabaptist Mennonite Encyclopedia Online. Retrieved 23 April 2019, from http://gameo.org/index.php?title=Relief_Sales&oldid=93366. Adapted by permission of Herald Press, Harrisonburg, Virginia, from Mennonite Encyclopedia, Vol. 5, pp. 759-760. All rights reserved.